FC Barcelona Lassa travelled to Italy with a clear objective: to ensure qualification for the quarter finals of the European League. They achieved their aim by beating Bassano 3-2 and this meant they were through to the next round with a game to spare. In the final group stage fixture they will attempt to secure first place, with Porto two points behind following their 6-2 victory over Merignac. The match started in the best possible way for the Catalans thanks to an early goal which set them on the path to victory. Pau Bargalló scored the opener two minutes into the match giving Ricard Muñoz’s side the lead. Barça Lassa were dominating and creating a flurry of chances and Bargalló again found a way through to make it 2-0 in the eighth minute. The Italians didn’t give up and got one back in the 15th minute thanks to Diogo Neves. The Portuguese halved the deficit with a long-distance shot but the blaugranas didn’t lose control as Pablo Álvarez re-established their lead four minutes later. Also, Sergi Panadero made a comeback having missed the last game against Lleida through injury. The blaugranas could have built on their lead before the end of the half but they weren’t quite able to find the finish. Both Álvarez and Barroso had attempts saved, with the later unable to convert a penalty. Even so, the Catalans were comfortable. 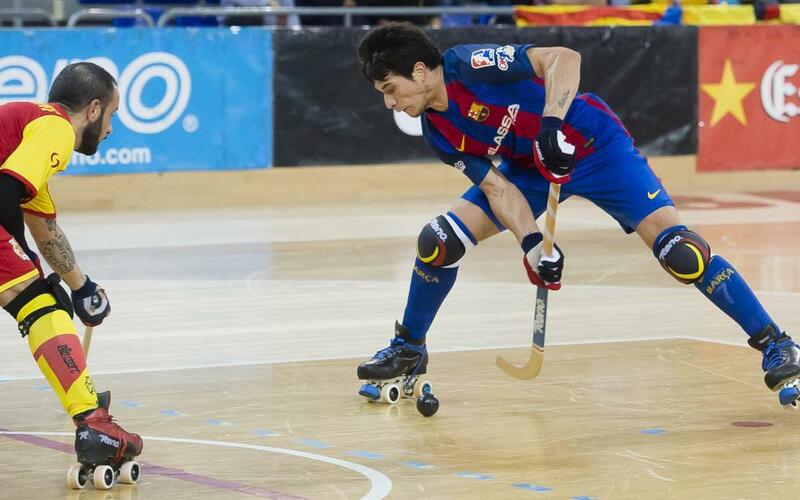 After the break, Barça Lassa continued to dominate and they looked to maintain their positive away result. However, the Catalans weren’t able to finish the game off and the home side almost levelled through a Tataranni free kick. When it looked like the home side’s fightback was over Panizza got a goal three minutes from time to come back to within a single goal (2-3). In the end, the victory was less comfortable than it looked like being but Barça Lassa still managed to secure their passage into the quarter finals in Europe. In the last match of the group stage, at the Palau against Merignac, the blaugranas will look to secure first place in the group knowing that a draw is enough. The opposition in the next round will be either Reus or Forte dei Marmi.